I have always placed soufflés in the “too hard” basket, but after experimenting a bit recently I was surprised at how easy they actually were! 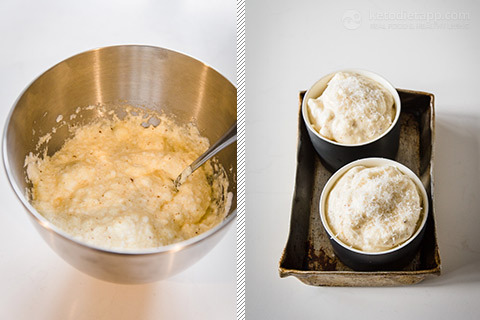 The trick to getting a really airy soufflé is to beat your egg whites until stiff peaks form, and then fold the rest of the mixture through until it’s just combined — if you over mix here you’ll lose some of the air you’ve just whipped in, creating a flat soufflé. 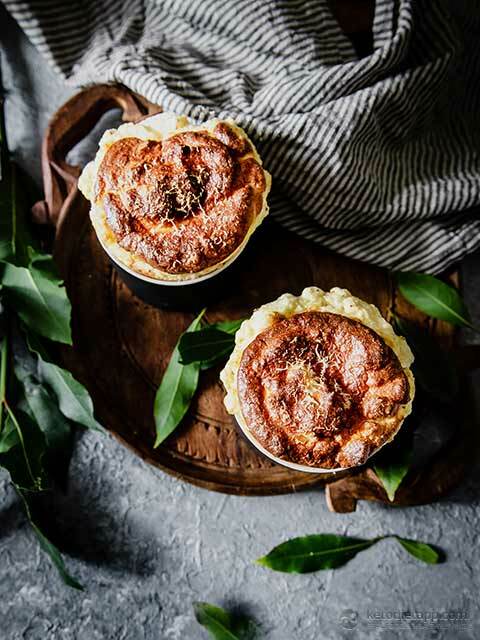 Despite being a little different to a more traditional soufflé in that these low-carb soufflés do not use flour to create the roux, you won’t notice the difference in the end result — they puff up beautifully with a soft, airy filling that melts in your mouth. 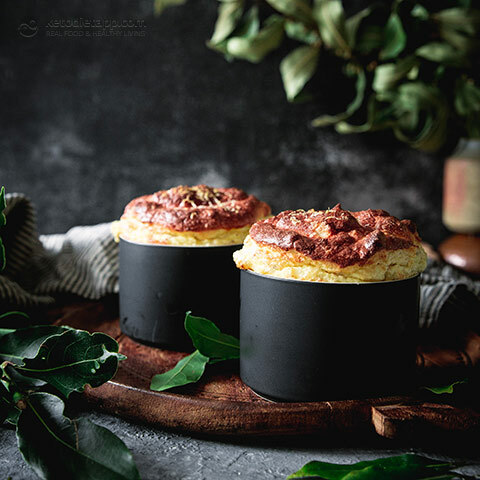 These keto soufflés are best served immediately, but if you do need to prepare them in advance, you can reheat the, at a slightly lower heat to get them to puff up again. Note that if doing this, you’ll need to ensure your ramekins aren’t too cold if they are ceramic (i.e. not straight from the fridge) otherwise they will crack when placed in the hot oven. Preheat oven to 200 °C/ 390 °F (conventional oven) or 190 °C/ 375 °F (fan forced oven). Grease three 1 cup capacity ramekins (or two 1 1/2 cup ramekins like I did). 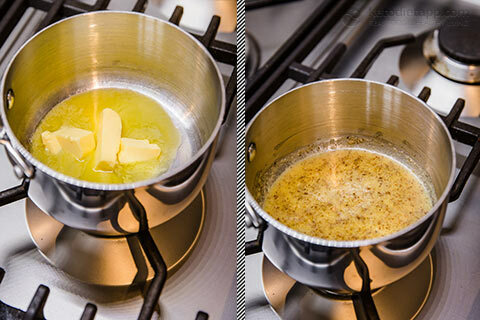 Melt the butter in a medium sized saucepan. Add the almond meal and salt and stir constantly until combined – it will thicken slightly, though not as much as a traditional roux. Add the milk and Dijon whisking constantly until smooth. Continue stirring until the mixture starts to boil, then reduce to a simmer and whisk until it has thickened slightly, about 5 minutes. Add the cheddar cheese and 2 Tbsp of the parmesan and stir to combine, then remove from heat. 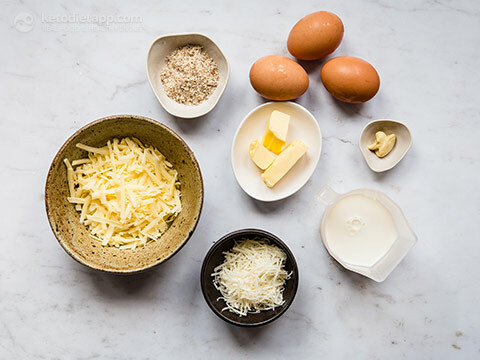 Stir the egg yolks into the cheese mixture and stir to combine. 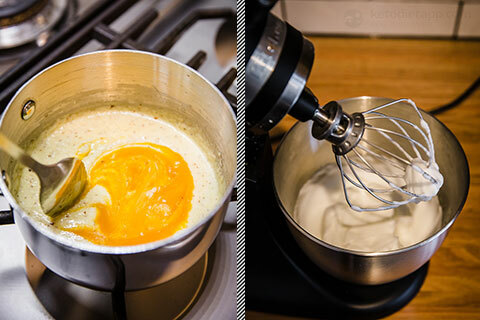 Beat the egg whites with an electric mixer until stiff peaks are formed. 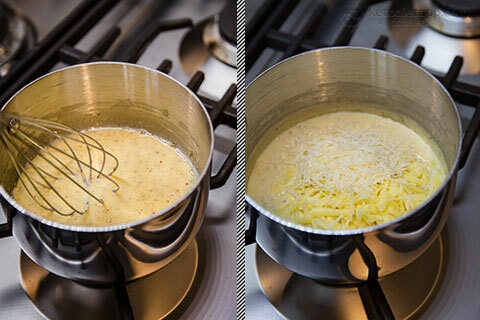 Gently fold the cheese mixture through the eggs until combined. Spoon mixture between the ramekins, and sprinkle with the remaining 1 tbsp parmesan. Place on a baking tray inside oven. Reduce heat to 180 °C/ 355 °F (conventional oven) or 170 °C/ 340 °F (fan forced oven). Bake 15 - 20 minutes or until puffy and starting to lightly brown. Eat immediately while still warm. Beautiful pics!!! I love cheese soufflé! Thanks for the recipe. 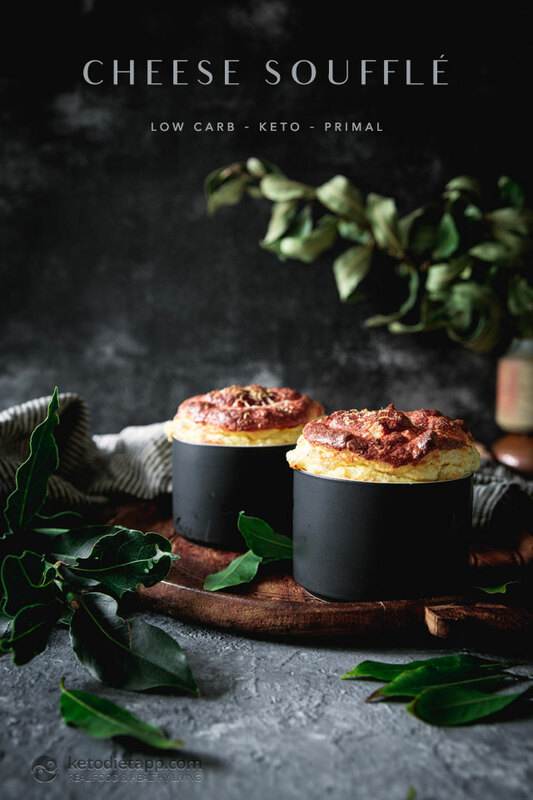 Also love your black ramekins - would love to know where to get them-they are perfect for this recipe! Thank you Mary! They are pretty and I'd love to get them too but I'm not sure I could. Dearna lives in Australia. 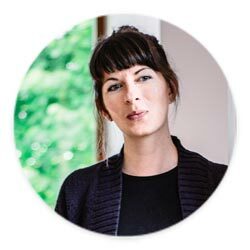 I saw similar ones in a home design shop in London but I'm not sure where to get them in the US. Can't wait to try this. 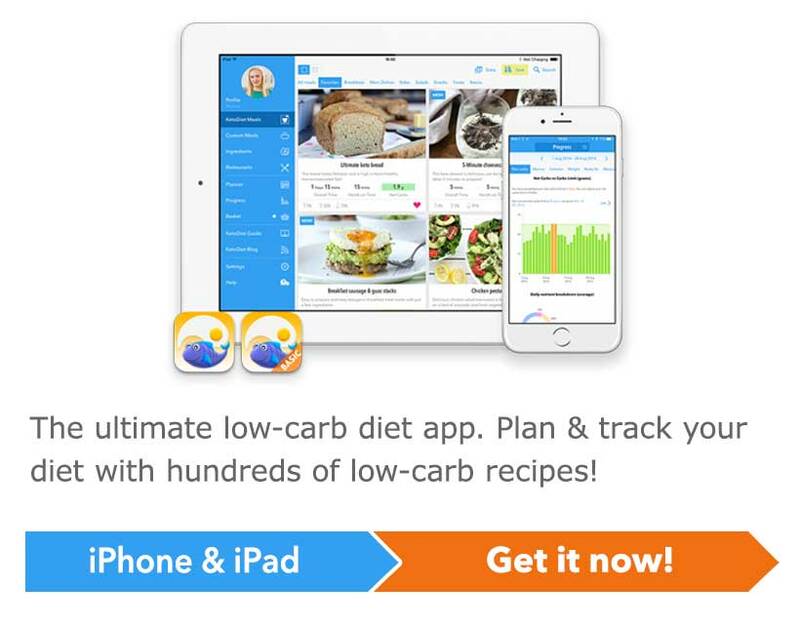 Do you think it would work in one normal souffle dish? My ramekins are really small. I can't see why it wouldn't. Thanks.